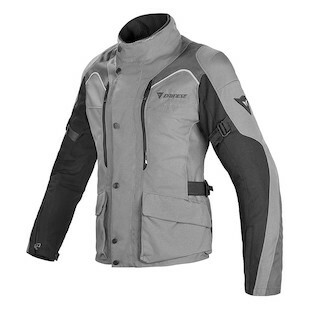 Dainese Tempest D-Dry: Storm Back! A violent windy storm! Yikes. Sounds like rough weather. Not the kind of forecast for the less-than-hearty souls among us. Fortunately, however, if you are reading this, you are probably one of the few out there who tread on regardless! The new Dainese Tempest D-Dry Jacket is a beefy choice for riders who do not want to give up their time on two wheels just because a little inclimate weather is on the horizon. Built with the standard issue composite protectors that you would expect from a top-tier manufacturer such as Dainese, this jacket has everything from a high, adjustable neck collar to anti-floating sleeve adjusters for optimal fitment. With a removable thermal liner, multiple air vents, and a D-Dry waterproof membrane, you can gear up properly when the weather report is less than stellar. For the lady riders out there, fret not, as the Dainese Women’s Tempest D-Dry Jacket is also available. Basically with this you will get all of the great features of the Men’s version, except it will be cut to better fit more feminine lines. While the Men’s version is more boxy and open in the shoulders, the Women’s edition will take into account proportional differences and has been put together as such. To round out the outfit, the Dainese Women’s Tempest D-Dry Pants serve the same function on your lower half. With pant-to-jacket zippers in place to help build a solid connection between the two, you will better be able to create a well-functioning seal between the gametes thus keeping the cold/wet out! As with the jacket, the pants also have a removable thermal liner, ample air vents, and the D-Dry membrane to keep them waterproof. So, if you are a rider who hears the weather report, but doesn’t always listen, storm back against inhospitable conditions with the Dainese Tempest Collection.